New measurements of several Earth-like planets in the TRAPPIST-1 system — located about 39 light-years away — suggest they are rocky and that some could have atmospheres that would allow life to survive there, ScienceNews reports. Why it matters: The studies (here and here) will help researchers to set priorities for the James Webb Space Telescope — the Hubble Space Telescope's successor scheduled to launch next year and search for life on planets around other stars. Researchers made new mass measurements of planets in the system and found six may "have more life-friendly atmospheres," per Grossman. Astronomers then looked for any indication of hydrogen around four of the planets — which they determine by observing the wavelength of light that can be seen as a planet moves in front of its star. Atmospheres rich in hydrogen can trap heat on a planet and make it uninhabitable. Three of the planets appear to not have hydrogen. 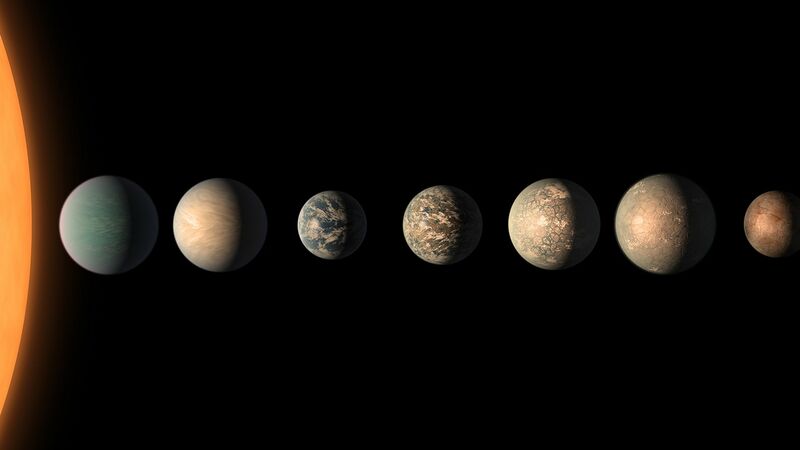 Yes but: "The new observations don’t necessarily mean the planets have atmospheres, much less ones that are good for life, says planetary scientist Stephen Kane of the University of California, Riverside. It’s still possible that the star’s radiation blew the planets’ atmospheres away earlier in their histories," writes Grossman. Of note: The size and density of one of the planets and the amount of radiation it receives from its star are similar to that of Earth. Go deeper: The new data confirms reports last year that some of the planets could hold water, possibly even 250 times more water than Earth's oceans, though that water may be in the form of atmospheric vapor or ice.